The white sandy Blue Flag beach at Keem is set in a magnificent horseshoe bay (see Keem Bay) with steep sides to the left and right, and a stepped valley to the back of the beach. This sheltered bay is said to have been blessed by St. Patrick during his stay on Croagh Patrick. According to folklore, St. Patrick looked out from the mountain and saw the golden beach at Keem and said that no-one would ever drown in its waters. Today safety is ensured during summer months by the beach lifeguards. Trawmore Strand is a fine sandy beach some 4km in length. It connects the village of Keel with Dookinelly and offers fantastic views of the famous Minuan Cliffs at the eastern end of the strand. This beach is popular with watersports enthusiasts, particularly surfers who enjoy the rolling Atlantic breakers. For bathers, it is only safe to swim at the western (Keel) end of Trawmore Strand due to strong undersea currents. Warning notices clearly demarcate the safe bathing areas. To the back of the sandy beach is a storm beach formed from boulders and shingle thrown onshore during storms. This barrier of rocks separates the beach from the low lying area of flat ground behind Trawmore Strand, which includes the area occupied by Achill Golf Club. This area has the status of 'machair', a habitat designated as an area of special scientific interest and which is confined to the west coast of Ireland from Galway to Donegal (the only other examples of machair in Europe are in Scotland). The old fishing village of Dooega lies on the southern side of Achill Island and its small, south-facing beach at Camport Bay is perfect for summer bathing. Dooega - and Camport Bay - lie on Achill's Atlantic Drive, a spectacular coastal road that overlooks the Atlantic Ocean along the southern edge of Achill Island. Dooega itself was one of the last native language speaking villages on Achill, and is still part of the Gaeltacht (a designated Irish language speaking area). During the summer an activity holiday centre is available for children with all lessons conducted in the Irish language. Camport Bay offers a shallow, sheltered beach, making it ideal for watersports and bathing. As it is located away from the more popular visitor areas of Achill, this beach tends to be less busy than other Blue Flag beaches on Achill. 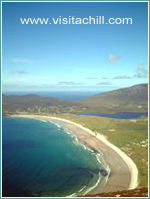 Dugort, on the north side of Achill Island, offers two Blue Flag beaches. This historic village was the first area on Achill to embrace tourism as the island's first hotel (the Achill Mission Hotel, later the Slievemore Hotel) was established here in 1840. It was to Dugort that the Irish artist Paul Henry was first taken when he visited Achill in 1910, though he quickly sought the less developed (at the time) village of Keel as his base. Dugort's two Blue Flag beaches look out onto Blacksod Bay and the Belmullet Peninsula is clearly visible to the north. The larger beach, the Golden Strand, is also known as Barnyagappul Strand. This name derives from the Gaelic Trá 'Bhearna na gCapall' meaning the strand of the gap of the horses. It refers to the times when horses were used to carry seaweed from the shore to local fields to use as fertilizer. The second Blue Flag beach at Dugort was known as Pollawaddy strand and this smaller beach shelters in the shadow of Slievemore mountain. On New Year's Day this beach hosts the first dip of the year as hardy locals (and visitors) bathe in its bracing waters.